It might seem like there is a designated month for every occasion. 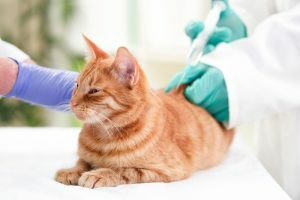 While that could be the case, there is no reason not to acknowledge pet diabetes month, which ends Friday, and educate yourself on what this means. With one in every 230 cats affected by diabetes mellitus and 1 in 300 dogs, there is certainly a need to raise awareness. Like humans, diabetes mellitus in dogs and cats comes in two forms. These forms are type I DM and type II DM. The first means that the animal’s body cannot produce enough insulin. Insulin is produced from the pancreas and is a hormone. Therefore, pets with this kind of diabetes must take insulin through a syringe twice a day for their lifespan. This type of diabetes occurs mostly in dogs. Type II diabetes means that some insulin is produced by the pancreas, but not enough. The same procedures of injecting insulin must be done; however, it isn’t a life-long disease. This type is mostly seen in cats and over time can go away. Some signs of diabetes include excessive thirst, increased urination, weight loss and increased appetite. If you think that your pet shows signs of diabetes, a blood test administered by a vet will be able to tell. Age, gender, obesity and other health conditions can be contributing factors that put animals at risk. In addition, certain breeds are more susceptible to diabetes. Take a quiz at https://usa.petdiabetesmonth.com/risk-quiz.aspx to learn if your pet is at risk for diabetes.